Do you enjoy training with a team? Want to add some variety to your training? 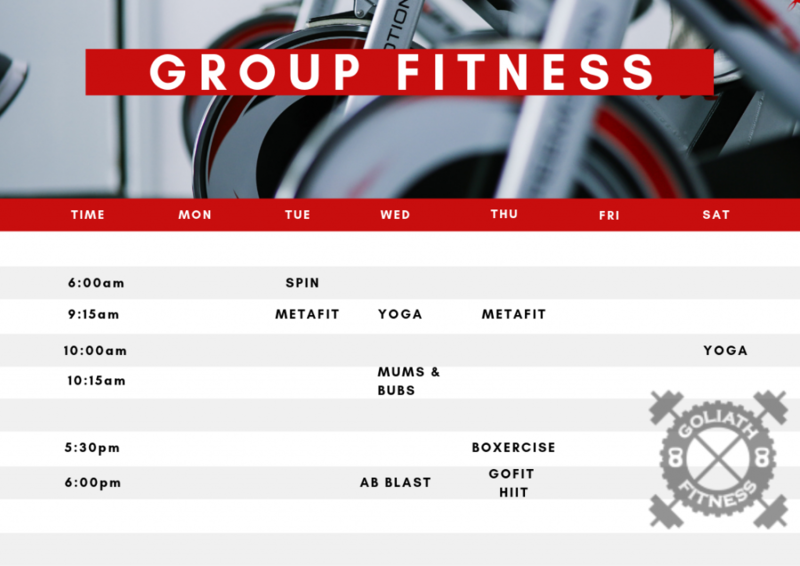 Try one of our group fitness classes! Our classes are suited to all fitness levels, so if you’re after a new challenge or want to have the added accountability and energy a group brings, come on in. Our in-house group training program, GoFit HIIT combines strength and cardio movements with functional fitness and the proven benefits of high intensity training to boost your fitness and increase strength. Will take you through a series of exercises focusing on all areas of your abdominals with a focus on core strength and stability. High intensity interval training that uses your own body weight to get results. A class for all post-partum women focusing on engaging the deep inner core muscles and building a solid foundation to get back into exercise after pregnancy. Combines strength and conditioning with boxing skills and drills that will not only develop sharper reflexes but will also improve cardiovascular fitness and stamina. No boxing experience required. A freestyle cycle class with various speed and intensities to kick your fitness into high gear. Yoga involves a flow of postures, moving from one posture to another focussing on your breath to open your body and connect your spirit. Suitable for all experience levels.